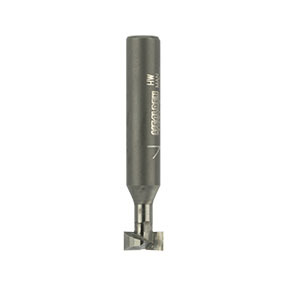 These single flute TCT cutters can be used to produce a keyhole recess for hanging frames, clocks etc. T1550 suits number 8 or 10 screw whilst T1552 is for number 10 or 12 screw. The cutter is plunged into the workpiece, moved 14mm, then reversed into the plunge position for withdrawal from the workpiece. 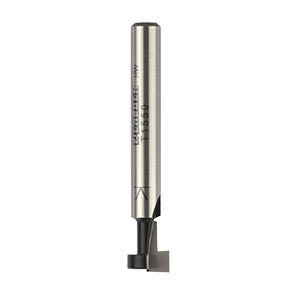 A two flute solid Tungstem Carbide version is available (T1554-8) offering superior performance when cutting more than 14mm long T slots. 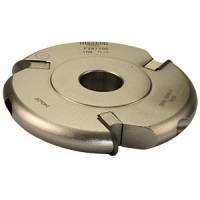 It is always advisable to make a relief cut with a diameter equal to dimension F before undercutting with the keyhole cutter. This will increase cutter life and help prevent overheating.